2017 has not finished yet as well as a wedding season. You still have plenty of time to use the trends we’re going to talk about for your future wedding. So, sit back, relax, take a pen, and make a note. Today we’re going to discuss the hottest wedding trends of 2017 every bride should be aware of. So, let’s get started. Before anything else, take a smartphone and download one of the following thematic planning apps – Wedding Wire, WeddingHappy, iWedPlanner, or Table Plan. These apps will be your personal assistants and helpers when preparing for one of the happiest days in the life. You can use them everywhere you need to note some bright, unexpected ideas. But don’t forget to install a VPN service on a smartphone in advance. In case, you don’t want your data to be stolen by hackers while using a public network. To choose a reliable VPN, go to the list of best vpns 2017 and pick anything you want. And now let’s go to those beautiful wedding trends of 2017. When it comes to a wedding, some things are timeless and some things are gaining popularity from time to time. The following 5 trends we’re seeing at most of the weddings right now. An outdoor setting is the number one location for a wedding in 2017. It can be a park, a beach, a winery garden, a botanical garden, a farm, etc. Metallic decorations are a big trend for the last several years. We can see it everywhere – rose gold cutlery, wine glasses, napkins in metallic colors, etc. The main rule is not to overuse those metallic accents in your wedding decor. It looks good just in the small elements. As it is a wedding, but not a disco party. Another decor trend is flowers. Flowers can be used in multiple ways and combinations – from the bridesmaid’s dresses to edible flowers in the food. For every bride, a dress is the most important element in the whole ceremony. In 2017, we can clearly see at least 3 very popular trends. The first one is a glamorous dress, which is hand embroidered, made from silk chiffon, and have a cape to put on. 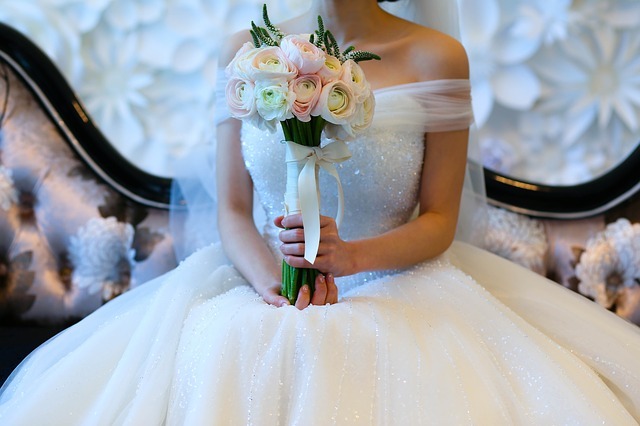 The second trend is a classic dress with a long veil, cotton lace, and a corset. And the last but not the least is a structured dress with a fishtail silhouette. When picking a wedding cake, most couples go for something elegant with fondant ruffles, textured icing, half-and-half decor, sugar flowers, edible lace, shimmer effect, layered icing, and a combination of different flavors. Night photos are definitely on the top in 2017. Couples take a moment in the evening and go outside with their photographer to take photos with really amazing light effect. Such photos create a truly romantic feel and atmosphere. And what wedding trend of 2017 is going to be your favorite?